There are just a few things that say "Christmas" to me. I think this is the case with most people. Those things can be varied and obscure, but are often rooted in tradition, nostalgia, and fond memories. Over the next few days, I'm going to attempt to write about a few of the things that make Christmas truly Christmas-y for me simply because of the nostalgia with which they are imbued in my mind. Back when I was very young, my mother made four fancy ornaments with ribbon, beads, and rhinestones secured to Styrofoam balls with regular and fancy-headed stick pins. This particular ornament pictured at left always held a certain amount of magic for me. It was so delicate and special. Mom always hung it up high on the tree so it wouldn't be disturbed. Although we children were allowed to handle the rest of the ornaments and decorate the tree with them, this one was handled by Mom. When Christmas was over, it (and it's companions) would be carefully wrapped in Kleenex and put into an oblong cardboard box. The following year when the ornaments would come out again, I always knew what was in the oblong box and anticipated it making its annual debut. Although some of our ornaments didn't survive the many moves we made during my childhood, this one always did. I couldn't necessarily count on which house we were going to be in in any given year, but I could count on that ornament being there on the tree. Later, when my mother started downsizing her Christmas decorations, she let us three children sit down together and divide out the ornaments. It was a fun trip down memory lane as we reminisced about all the years of decorating the tree, the animals that would un-decorate the tree, which house we lived in and when, etc.. I was so happy when I was the one that got to have the special ornaments that Mom had made so many years ago. I got the oblong box and the 30 year old Kleenex tissues too. Now this particular ornament still makes it annual debut in our home, except it is hung in a place of honor on an ornament stand instead of on a tree. It's beautiful. I have a couple that my mom did with the styrofoam balls, but they're more countryish, not elegant. Maybe it was a RS thing?! LOL. A special ornament for a special lady. It's lovely, Cindy, and so intricate that it's hard to believe it made it through all these years! 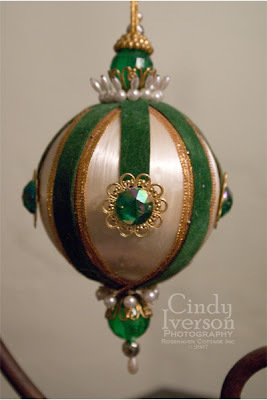 Ah Cindy, my mom made ornaments like those, too!!! Beads and velvet ribbon and such. I sure don't remember those being gotten rid of, but darned if I know where they are. Mom gave them to us YEARS ago, and we used them on our tree for a few years. Thwe ornament your mother made is by far ,more exquisite than anything you see today. It looks like an heirloom, and I suppose it is. What makes it special is that it was made by someone( your Mom) who took the time to make it right! She did a very nice job. It deserves it's own place for display . How beautiful. Your mother was a very unique artist. That is a classic treasure. What a very special heirloom with wonderful memories. I have ONE thats similar...I think it came from my mother...it's always been there so I'm not sure where it originated from. Your's is lovely...I'm sure the memory attached to it is priceless. Such a dear touching story Cindy...I have boxes full of vintage ornaments brought over from Germany...I often sit and wonder wishing I had someone to pass them on to who would treasure them as you do your mothers. Maybe my Grandchildren some day. Before Christmas I will feature my Oma's ornament that I treasure each year like you do your moms. 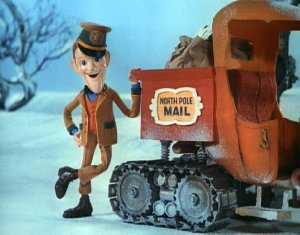 Much holiday love to you and your family and that sweet little tike Skate! Thanks for sharing this lovely story with us Cindy. Your mother made a beautiful Christmas ornament and I'm happy for you that it is yours now with all those wonderful memories attached to it. Oh wow, that is so special. And it's beautiful! You have a very clever mom! That is a lovely story, and a beautiful decoration. Thank you for sharing.